"1985 Application Summary of Nomination"
This is the 1985 Application Summary of Nomination of the Rainforests of the Tweed Volcano Group World Heritage National Parks of NSW and Southern Queensland, Australia. The sites of the Tweed Volcano Group occupy a region which was the centre of the most extensive rainforests in Australia. Despite clearance by Europeans, the area still supports large rainforest stands and a range of vegetation types. The subtropical rainforests are extensive and the best developed in the state. Both warm and cool temperate rainforest approach their northern limit in the area and the nominated sites include significant stands of these phytogeographically important vegetation types. 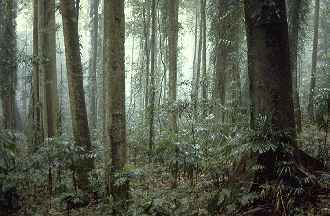 Extensive areas of dry rainforest with a hoop pine overstory are found in the western part of the Border Ranges National Park. Wet Sclerophyll forests, and intergradations between rainforest and wet sclerophyll forest, are also well developed in the nominated sites. The region is one of outstanding biogeographical significance. The flora contains a mixture of northern and southern species (the McPherson-Macleay overlap) and a number of endemic and rare species. The fauna is similarly marked by a mixture of northern and southern elements and species are highly diverse. For a number of faunal groups, the species diversity is the highest on the continent. This reflects the diversity of environments from sub-tropical to cool temperate, and the continuity of this environmental diversity through climatic fluctuations of the late tertiary and the Quartenary. Geologically the region presents an excellent example of an erosion caldera of a major volcano. The differential erosion of basalt and rhyolite has produced a landscape dominated by striking vertical cliffs and some of the most dramatic scenery in Australia. 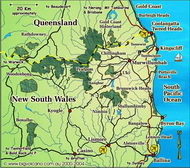 In 1987 the NSW NPWS released a revision of the “New South Wales Rainforests - the Nomination for the World Heritage List”. Originally authored by Dr Paul Adam, the revision was done by Dr Adam, Michael Duffy, Gary Bridle and officers from the NPWS. Copies are still available in many local visitor centres, or contact NSW NPWS for more details.